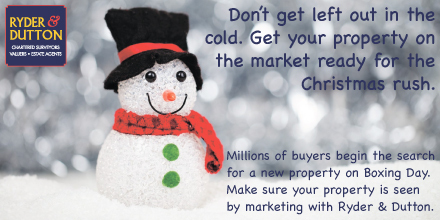 Christmas isn’t quite here yet but we are looking ahead at Boxing Day and the millions of people who start their property search from this point. Many assume that December is a quiet time for the property market, when interest dies down but quite the opposite is true. Statistics show that hits on property portals spike on Boxing Day and continue to climb between Christmas and New Year. This gives us plenty of time to get perfect marketing in place to get you sold quickly, and at the best price. It makes sense that post Christmas is a busy period. People have time off from work and can sit down to search for their new home. Also, a cramped Christmas with all the family may be the push they need to look for a new home. Seasons used to dictate the activity in the market but now, Nationwide, there is a shortage of properties and motivated buyers can’t afford a break during December from looking at properties. However, many potential sellers still think New Year is the best time to sell and miss out on the heavy online traffic between Christmas and New Year. By marketing your home from Boxing Day, there is less supply and competition and thereby more people will be looking at your home. Some sellers worry about viewings prior to Christmas as they anxiously prepare for this busy time but by getting everything in place prior to Boxing Day, we can avoid the hassle of pre-Christmas visitors. It is important that we get all the photography done prior to decorations being put up which would make pictures look dated. Whilst serious buyers are looking during this time, you can capitalise on this interest whilst still enjoy one last festive season in your home. By instructing us soon to launch on Boxing Day, we can approach any potential buyers who may be interested in your home and line them up for viewings after Christmas. If you would like to talk to us about launching your property in time for the post Christmas rush, please contact us on 0161 925 3255.